Central Heating Systems are a worthwhile area of investment for a vast majority of homeowners in the UK. Ocean Plumbing and Heating specialise in the installation of Central Heating systems – Our fully trained team will provide you with honest advice and will help to select the right system for you. We can even check your existing system and perform the necessary work for it to run as efficiently as possible, saving you money on energy bills while also making your home more environmentally friendly. We work closely with the best boiler manufacturers in the business, meaning you can be in complete confidence you are receiving the highest quality components. Our service is timely, professional and cost-effective. Customer satisfaction is our top priority, we will take every measure to ensure that you are happy. Here at Ocean Plumbing and Heating, we highly recommend the new high efficiency condensing boilers, supplied by the leading manufacturers. Instead of having a single heat exchanged, these new boilers have 2. Conventional boilers use about 80% of the gas you put in, which is converted into heating or hot water, this excess 20% gets pumped out into the atmosphere (and wasted!). With a high-efficiency boiler, the 20% is recycled and brought back into the system, allowing you to save a considerable amount on your energy bill. When compared to a standard wall mounted boiler (which runs at approximately 70% efficiency), an average three-bed semi-detached house with a saving £900 in the expected fifteen-year lifespan. At Ocean Plumbing and Heating we specialise in supplying and installing a range of hot water cylinders and these are available in two variants, vented and unvented. The first variant of hot water cylinders available are Vented. These are typically located on the first floor of your home and are fed by a cold-water storage tank in the loft area and use gravity to fill the cylinder. Your homes water flow is dependent on the distance between the cold-water storage tank and your hot water cylinder. You will usually find that your taps on the ground floor have a greater water pressure because of this. Your hot water supply isn’t reliant on a mains water supply, which means if you were to lose your main supply, you would still have a hot water source until the cold-water storage tank was emptied. 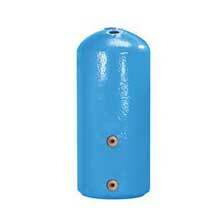 Vented cylinders are generally less expensive to Purchase, Install and Maintain. Water flow rates from Vented Cylinders are generally poor compared to the alternative options available. Poor flow rates effect items such as Showers. If you require a more powerful shower, you usually have to install an additional pump to supplement the pressure that is lost. If the water in the hot water tank is old, it can scale up and become slightly more difficult to heat which results in higher energy bills. Some old cylinders in older properties have no lagging which is designed to insulate the cylinder and keep the water hot. Without lagging cylinders are less energy efficient and will cost more to run. They are usually full of limescale and again this reduces the overall energy efficiency of your hot water system. Any cylinders without lagging should really be upgraded to meet more recent building regulations. This is a typical old Vented Hot Water Cylinder with no Insulation or lagging as it is also known. This is a modern Vented Cylinder with a layer of Insulation to confirm with more recent building regulations. The second option you have when choosing your hot water cylinders for your home or small business is Unvented. 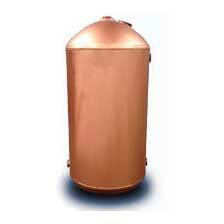 Unvented hot water cylinders use the main cold-water feed coming into your property. These are pressurized systems which do not require a traditional cold water storage tank in the loft. The lack of a water storage tank eliminates the worry of any leaks, floods or pipes freezing in your loft. This can also impact your insurance premium in a positive way. 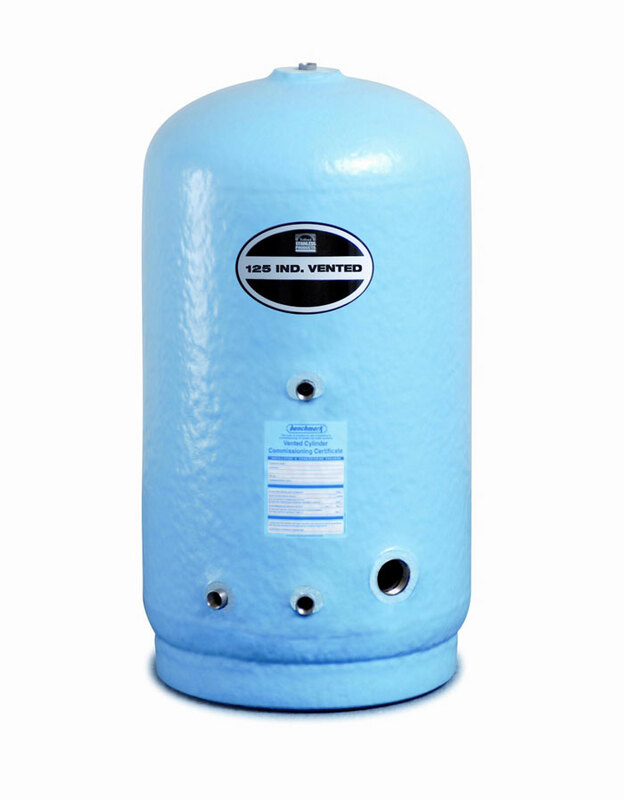 Not everyone has the space available for a cold-water storage tank, so a vented cylinder is the ideal option for your hot water system. Due to the cylinders working from your mains supply, the water pressure is significantly improved which means you can fill your baths quicker, your showers are more powerful and there is no need for additional shower pumps. These systems are also very quiet compared to vented cylinders due to the lack of the cold-water storage tank and they can be cited virtually anywhere in your home. Unvented cylinders are usually made from Stainless Steel and come with a 25-year guarantee for peace of mind. Compared to vented cylinders, unvented cylinders can be more expensive to install, although as with most energy efficient alternatives the savings can go some way to pay for the system over a longer period of time. If you have experience any loss of mains water, you will unfortunately lose your hot water supply until a time when your mains supply is restored. Losing mains water supply in the UK Is a rare occurrence though. 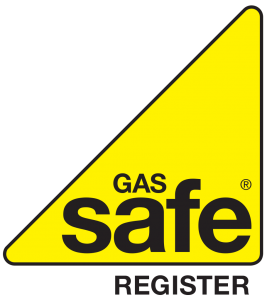 Choosing between a Vented or Unvented Cylinder can be a difficult choice to make and we are happy to meet up and carry out a survey, so we can ensure you have the right system for your home. Give us a call on 07973 702841 or fill out our Contact Form and we will be in touch soon. For a comprehensive central heating or hot water system installation, get in contact with us today on 07973 702841. You can also email us by completing the form on our Contact Page.